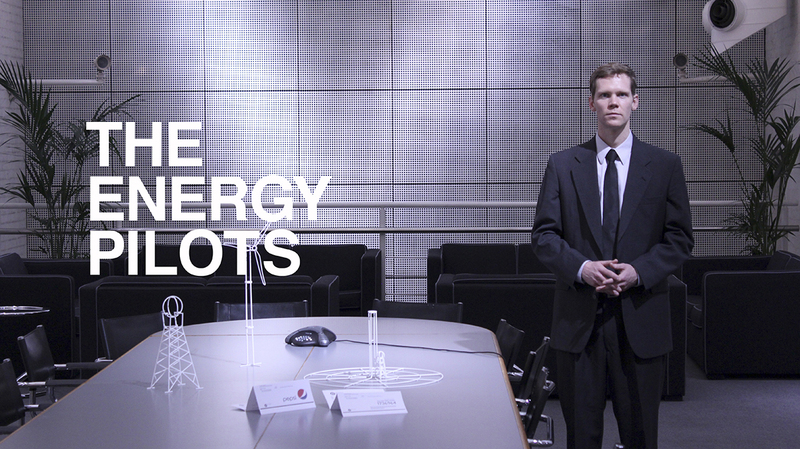 Still from The Energy Pilots 2011 promotional video. photo: Koby Barhad, Courtesy of The Energy Pilots. A backup city for Tokyo. with fossil fuel offerings. The Energy Pilots research program set out to analyze a number of economic strategies commonly used in industries outside the energy sector. Each strategy was to profitably manipulate economic exchange mechanisms, unlike the low-carbon energy industry’s traditional service-for-flat-fee ($/kWh) model. of alternative business practices, many of which could potentially compromise the benevolent image of green energy companies. In an effort to study these reactions as well, The Energy Pilots established the following three-part method, which it made public at the U.K. Energy Research Centre’s Sparks Energy Symposium in late March 2011. Energy Pilots representative presenting at the Sparks Energy Symposium in March 2011. photo: Ludwig Zeller, Courtesy of The Energy Pilots. When monitoring and modification collide. to its proposals. Early on, The Energy Pilots focused on five case studies that came to define the program itself—each directed by the program’s bespoke method. The first pilot was possibly the most implementable. The “Customer Stratification Model” borrowed business structures used in the banking and mobile phone industries, among others. Businesses in each of these industries stratify their customers into several pay rate tiers; from premium to basic. Customers paying a higher rate get enhanced services, while those paying a lower rate may actually receive artificially diminished services, like caps on minutes of phone usage. Based on this model, The Energy Pilots program architected a tiered structure for low-carbon energy providers, in which basic customers would pay a reduced rate and would be limited to evening and nighttime energy consumption. By securely shifting a large load to off-peak hours, energy companies would be able to avoid the use of peaking plants or expensive storage systems, saving costs and increasing the net profit from services provided. As a way to model and study the social consequences, the program proposed the system to possible users, along with a simple home energy storage device that could be plugged in overnight and harnessed in the morning for minimal energy needs, like making toast. Analysis is ongoing, though responses from base-rate customer groups were tepid in early studies. Cost saving may be a driving factor for adoption in lower income brackets. 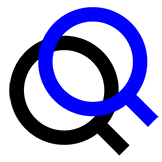 The second test in the series proposed to offset costs by appropriating available infrastructure components as advertising channels, aptly dubbed the “Advertising Capital Model.” A number of advertising channels were put forth in early discussions between Energy Pilots researchers, including energy bill advertisements. But the option that called for the most involved investigation pitched a type of advertisement messaging akin to aerial skywriting. The aircraft itself was replaced by a wind turbine, adapted with nontoxic smoke emitters attached to the column of the structure. 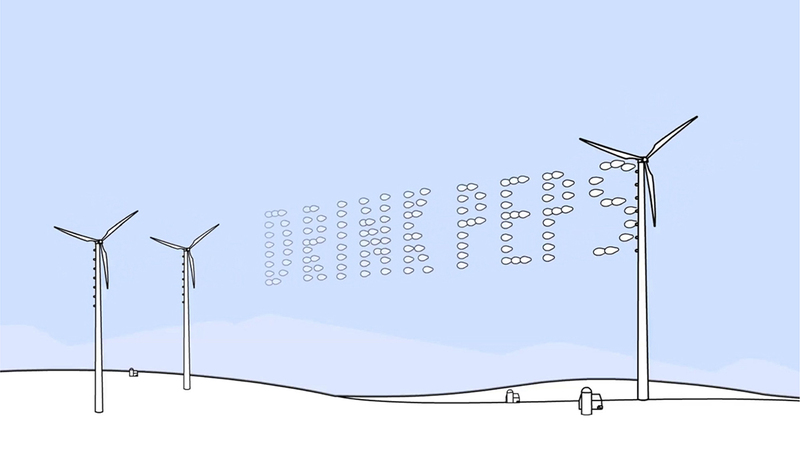 According to the design proposal, the smoke emitters would synchronously excrete billows of smoke, carried by the wind, to form smoke-pixel typography in the sky. These messages would be visible from great distances and thus would likely draw a sizable revenue stream. Turbine printing schematic rendering. Courtesy of The Energy Pilots. As an unprecedented and experimental proposal, The Energy Pilots called for further investigation to help forecast social reactions to the hypothetical strategy. 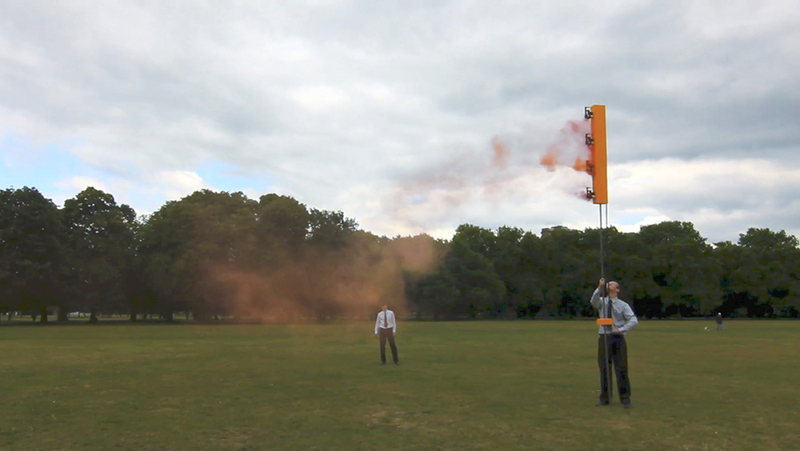 The program constructed a scaled-down representative device, featuring four smoke emitters, and reaching a height just under five meters tall. An Energy Pilots operator at the base could trigger the emitters individually to modulate the smoke patterns, approximating the visual effect of the proposed advertisements. Over the deployment period, public reactions ranged from intrigue to rage, with much conversation interspersed. On a particular deployment mission in London’s Victoria Park, a group of footballers were halted mid-game by the turbine printing demonstration, watching as the bubbles of smoke billowed out of the machine and drifted across the park. As the demonstration concluded, focus returned to the ball, and the match resumed. Wind printing deployments have now ended, and the results of the tests are being presented to energy researchers for review. 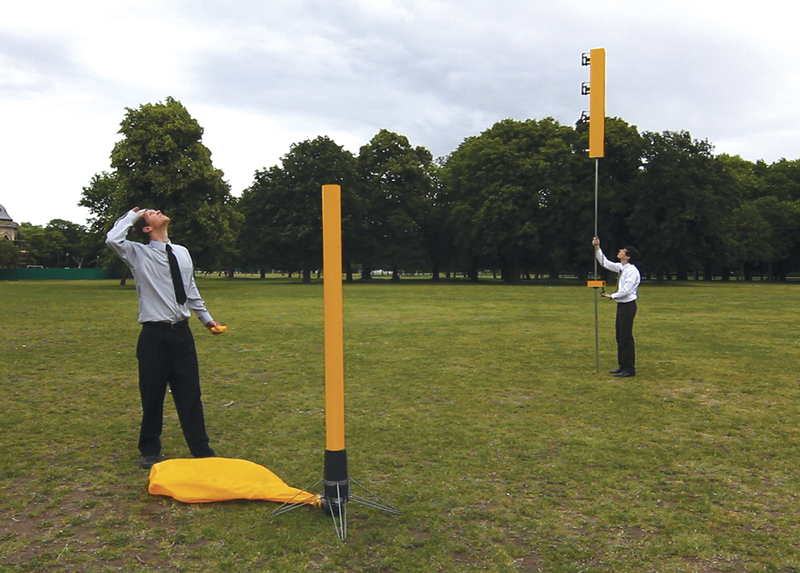 Energy Pilots researchers deploying the Wind Printer device in Victoria Park, London. photo: Daniel Adderley, Courtesy of The Energy Pilots. Platforms such as the U.K. Premium Bond system attract buyers by leveraging the psychological thrill associated with the chances of winning a prize. In this case, each time a bond is purchased, the buyer is entered into a lottery with a (1 in 26,000) chance to win £1 million. The Energy Pilots proposed that this same psychological motivator could be used to attract energy customers to a more costly low-carbon service, and devised the premise of a solar lottery. In this hypothetical system, a customer is entered into a lottery when they pay their bill, reframing bill payment as an entertainment activity. around the proceedings and selection of winning numbers. The Energy Pilots borrowed this strategy as well and developed early schematics for a solar lottery-ball tumbler. The tumbler was designed to be an add-on to centralized solar plants, using the excess heat generated by the plant to tumble oversized lottery balls atop the tower. Solar Lottery schematic rendering. Courtesy of The Energy Pilots. Again, the program directed its effort toward researching social perception of this proposal, and did so by constructing a reduced-scale solar lottery-ball tumbler. The device incorporated a parabolic dish connected to a steam generator, which rotated numbered balls within a chamber and eventually dispensed the winning numbers at random. General reactions to the solar lottery were overwhelmingly positive, though correlations between mood and weather are suspected since the solar lottery-ball tumbler is only deployable on sunny days. A small but noteworthy minority of interactions with the public revealed a concern regarding the imbalanced nature of lotteries as funding mechanisms, since many participants have poor comprehension of the statistical likelihood of winning. Despite the high levels of interest, the social viability of this model is still being assessed by energy professionals. 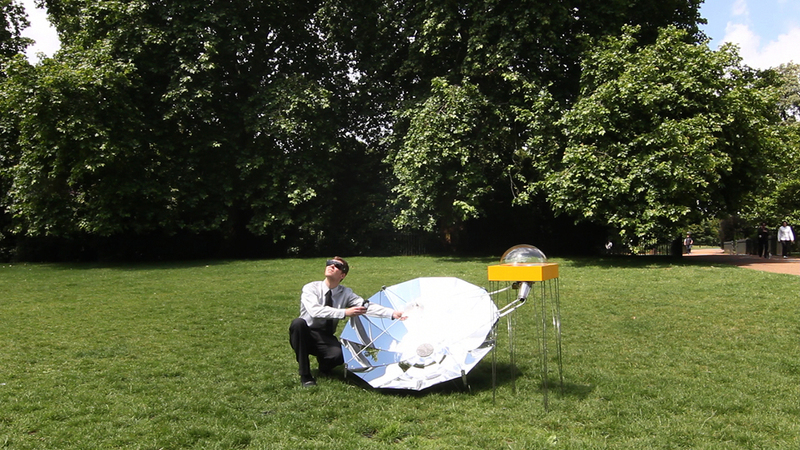 Energy Pilots researcher testing the Solar Lottery Tumbler in Hyde Park. photo: Diego Trujillo, Courtesy of The Energy Pilots. The fourth case study explored by The Energy Pilots program focused specifically on the needs of an emerging technology—the solar updraft tower. This uncommon technology generates electricity by capturing passively heated air under a massive canopy and channeling it up through a tower, rotating a turbine. Maintenance and operation of an updraft tower can be minimal, but construction of the plant requires large amounts of up-front capital. As a way to provide investors with an increased sense of stability, The Energy Pilots recommended a business model that could provide a concurrent revenue source unimpeded by fluctuations in energy prices. 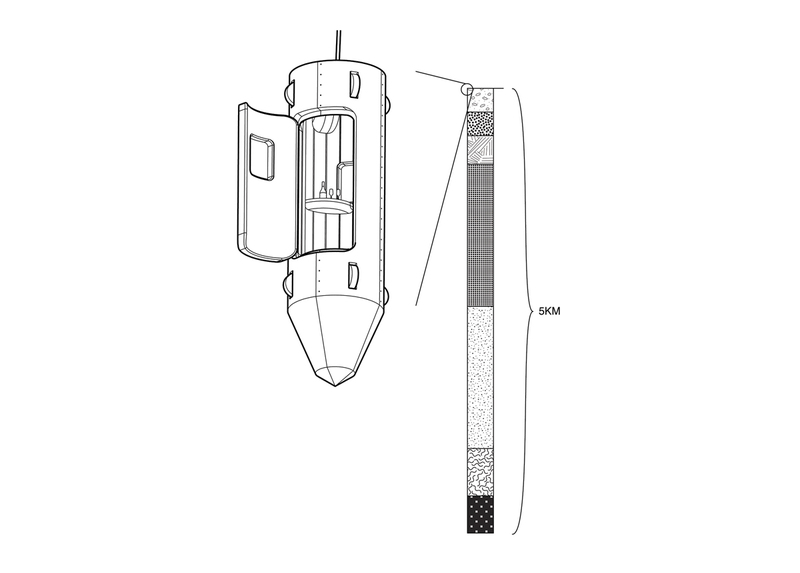 Schematic rendering of an addition to the solar updraft tower. Courtesy of The Energy Pilots. 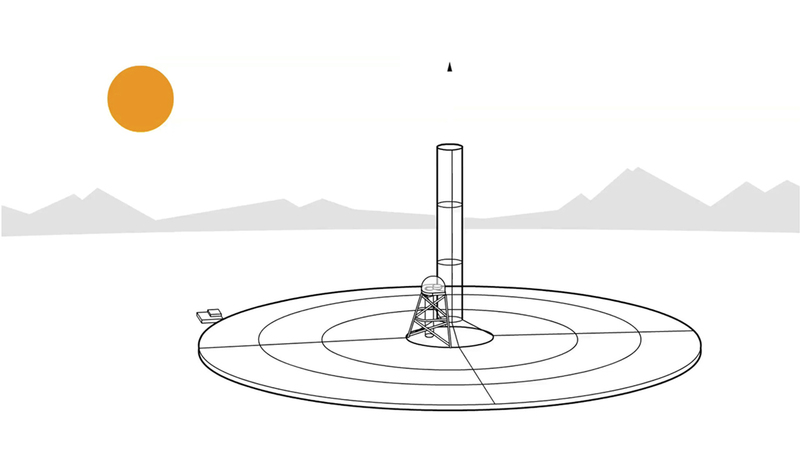 The Alternate Service Model suggests that the solar updraft tower owner could provide an entertainment service using the exhaust from the plant, allowing visitors to launch objects of their choice out the top of the tower for a fee. Like the prior business models envisioned by The Energy Pilots, this proposal demanded intensive social testing before it could be confidently presented as a viable strategy for updraft tower developers. To test the public reactions, an updraft replicator was constructed using an industrial air chamber and launch tube. The assembly was used to launch items with public participants, often beginning discussions around the viability of this model as a funding mechanism. Interest in launching was very high, substantiating the efficacy of the business model. 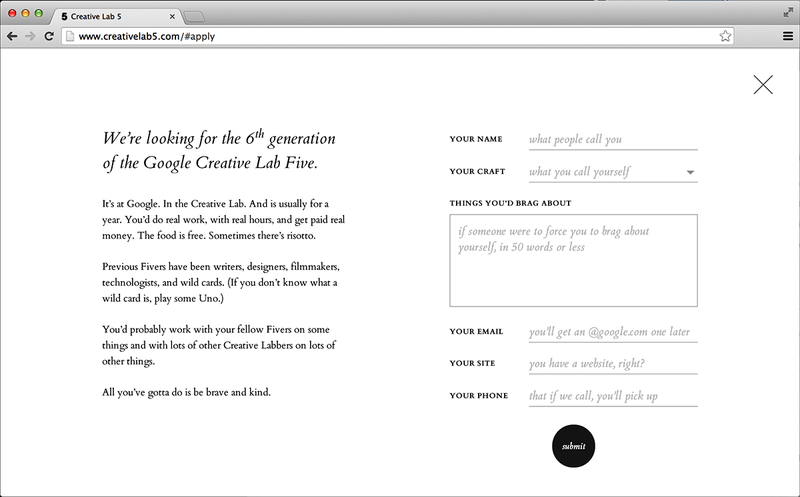 Researchers were surprised by the range of items that individuals reported they would like to launch. Suggestions by the public included items such as cremation ashes, love notes, and birdseed. After further consideration, many respondents grew uncomfortable with the thought of low-carbon energy services being subsidized by a service that would deposit debris in nearby deserts. Energy Pilots researchers deploying the Updraft Replicator, with the Wind Printer visible in the background. photo: Daniel Adderley, Courtesy of The Energy Pilots. A fifth and final study conducted by The Energy Pilots found inspiration in the likes of Sir Richard Branson’s Virgin Galactic space travel services. This model aimed to bring in preliminary capital from extremely wealthy patrons by offering a unique extreme tourism service. In this case, The Energy Pilots detailed a model specifically for operators of enhanced geothermal systems that run anywhere between 5 and 10 kilometers deep. The plan would open these geothermal facilities for exclusive “Hyper-Historical Tours” before being commissioned, capitalizing on the implicit scale and potential danger of traveling down into these subterranean shafts. This early revenue would drastically offset the cost of excavation, subsequently making energy virtually free for most consumers. Schematic diagram of the proposed Hyper-Historical Tour. Courtesy of The Energy Pilots. In order to examine social reaction to this proposal, a simulator was constructed and deployed in the vicinity of costly events taking place in London. Wealthy opera and theatergoers were offered a chance to test-drive the tour, with complimentary champagne in hand. After experiencing the simulated tour, many of the public participants were intrigued by the idea and suggested they would be willing to pay for a service like this one. When questioned on cost, participants felt it should cost less than Branson’s space travel service. There was no ethical hesitation voiced by participants in these studies. The most difficult question that remains unanswered by The Energy Pilots asks where our society’s collective moral compass will point if we’re presented with ethically challenging routes to low-carbon energy futures. We will almost certainly have to make compromises to correct our course toward viable climate. Are we willing to live with smoke advertisements filling our horizons, solar lotteries luring us, or detritus in our deserts? What cultural sacrifices are we willing to make to reach a state of low-carbon energy generation? What is a sustainable future worth? 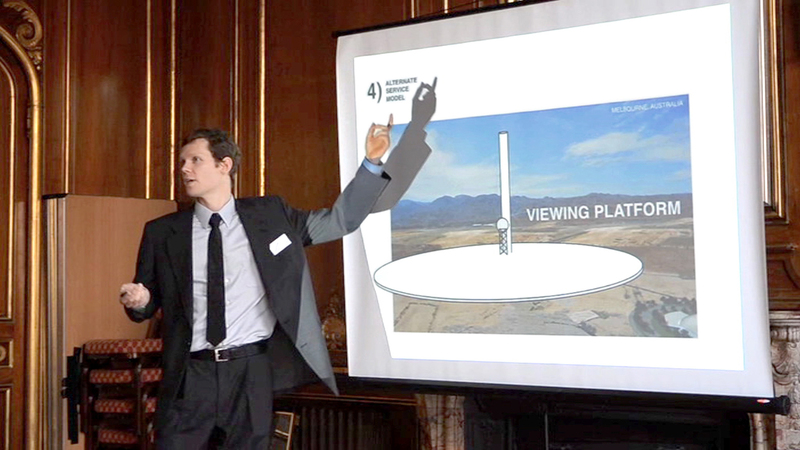 Elliott P. Montgomery is the founder of The Energy Pilots, a project he developed while at the Royal College of Art’s Design Interactions program. In this and his other works, Montgomery uses speculative design methods to probe social and environmental implications of emerging technological scenarios. He currently teaches design strategies at Parsons, The New School for Design and has practiced as a design consultant for clients such as Autodesk, GE, LG, Honeywell, and the NYC Department of Education. His work has been exhibited at institutions around the world, including the Museum of Art and Design, the Shanghai Powerstation of Art, the Cite du Design International Biennale, and The Storefront for Art and Architecture. Montgomery is a former design research resident at the US Department of Energy’s ARPA-E, a Core77 Design Award Winner, and an Andrew Carnegie Scholar.